'FairyWorlds' runs Thursday–Saturday through Sept. 2 at the Cannery. 3 W. Third St., Santa Rosa. 8pm. $10–$36. 707.523.4185. STUFF OF DREAMS Chris Schloemp and Joseph Favalora (front left and right) take 6th Street to the Cannery. 'There has always been this perception that Shakespeare is long and boring," says Jared Sakren, executive director of 6th Street Playhouse and the director of FairyWorlds!, the recently opened outdoor extravaganza at Santa Rosa's Shakespeare in the Cannery Festival. Formerly artistic director of Southwest Shakespeare Company in Mesa, Ariz., Sakren says he's heard the "long-and-boring" thing over and over. "So," he says, "I decided to take it on and change people's minds." That's how FairyWorlds! was born. 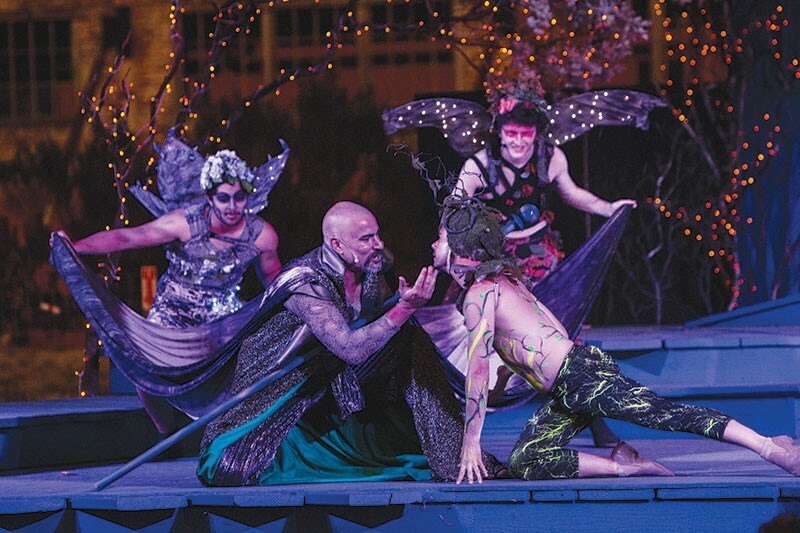 A 90-minute, elaborately visual, audience-interactive take on Shakespeare's Midsummer Night's Dream, the dazzling show was originally staged outdoors at the Desert Botanical Garden in Phoenix in 2014. "The show was huge, produced on a very grand scale," Sakren says. "It had ballet, fire-eating, amazing costumes, fairies with electric wings and all kinds of outrageous circus-type elements. It was not boring." Furthermore, it was successful at attracting people who had always believed Shakespeare was overly complex and hard to appreciate. "It was a show done for people who love Shakespeare, and for people who hate Shakespeare," says Sakren. And now that he's relocated to Sonoma County, Sakren has brought FairyWorlds! to life again. Staged in the old cannery ruins in Railroad Square, the show has been adjusted to the open landscape of the cannery. Featuring a cast of nearly 40 actors, and enough space for the audience to be surrounded by fantastical folk, the Santa Rosa version is, if anything, even more interactive than the Arizona version. "We have more fairies in this show than we had in the desert—not a lot more, maybe six," says Sakren. "But they come in much closer contact with the audience now." Though stripped-down textually, the basic story of Midsummer is intact. After fleeing Athens to avoid the marital demands of their parents, four young lovers (Abbey Lee, Devin McConnell, Haley Rome, Benjamin Stowe) find themselves lost in the woods, and right in the middle of a battle between two powerful fairies, Oberon (Chris Schloemp) and Titania (Elizabeth Henry). Complicating matters is a band of Athenian craftsmen, led by the dim Bottom (Craig Miller), all taking to the woods to rehearse a very strange play. "The story is all there, and then some," Sakren says. "I don't want to spoil it, but there's a scene that Shakespeare refers to but never actually shows us. It's a very, very big scene, and it involves swords. Well, in FairyWorlds! we finally get to see it. It's pretty cool."